What you can see here is very typical element of Thai architecture – a chofa. You find it placed on roofs, and it is often covered with colorful glass mosaics like this one here. It’s nearly impossible to go sightseeing in Bangkok and not notice these. Would you like to know what they’re about? They actually have a mythical meaning. These decorative roof elements actualyl represent the Garuda, an important mythical creature in Thailand. There are different explanations, although most scholars agree on the Garuda representation. Chofa literally means “bunch of air”, but is often more poetically translated as “tassel of air”. And such a poetic rendition suits this most distinctive feature of Thai architecture. On top of the mighty sweeping roofs of a bot (monks’ congregation hall) or vihan (worship hall) is placed an elegant upward curving finial. They are placed on the peek of a roof overhanging the edge. Although, they vary in style, they all possess an elongated ‘s’ shape which is suggestive of an animal form. Sometimes the head is half way up the chofa and sometimes it is at the end. More often than not the appearance is of a bird-like creature with a graceful horn. The history and exact significance of ‘Chofa’ is disputed. The chofa could be a representation of a garuda – a Hindu mythical bird that is the ‘vehicle’ of the God Vishnu; or it could be a hamsa – which is a goose, gander or swan in Hindu mythology that is the mount or vehicle for the God Brahma. Another possibility is that it represents a snake or naga. This last option is confusing because nagas are key components of Thai iconography that are found else where in temple compounds. The naga is the half sibling of the garuda and its sworn enemy. As seen in the picture below, often nagas adopt the pose and style of a chofa and it might be possible to label such examples of Thai architecture as ‘naga chofas’. Naturally opposites in eastern thought are often just 2 sides of the same coin, different aspects of one reality – whether it is the one soul (Atman/Brahman) of Hinduism or the absolute nothingness of Buddhism. Indeed motifs seemed to be combined in creative ways. In one of the pictures below the naga body splits into buddha heads. Furthermore, the naga head often has a bent horn on it that is very much like a chofa. The replication of forms adds to the impressiveness of the architectural forms found in religious buildings in Thailand. 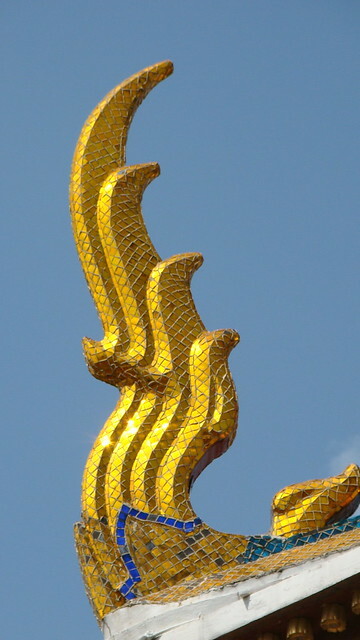 The Naga or snake motif is another important iconic motif in Thai architecture. They are most commonly found on the hand rails of stairs (especially in the ‘Lanna’ style of Northern Thailand); or running down the edge of a temple roof. The body is sometimes coiled, but the head is usually raised. Often there are multiple heads. For Thais the naga is a symbol of comfort and security because in the Buddhist scriptures a mystical serpent is described as protecting and sheltering the Buddha as he meditated. Some of my favorite architectural features of Thai buildings are the creatures on the roofline: birds and serpents that guard boundaries of the sacred structures. The chofas (sometimes spelled chofah, cho fa, or cho fah) are bird guardians and live on the peaks of each gable. In areas with many religious buildings, like the Wat Phra Kaew complex or the Wat Pho complex, the elegant silouettes of the chofas are everywhere, gleaming in the smog- and humidity-filtered Bangkok sun. Unlike much Thai art and ornamentation, which can be distractingly ornate, the chofa is a simple, yet sublime, object. The shape of a bird is suggested with the minimum of detail. In some buildings, the chofa “grasps two nagas [serpents] in its claws…”, with the nagas sloping down the edge of the roof. The chofa has significant import ance, and some buildings are not considered consecrated until chofas have been fixed in place. The naga is a snake, sometimes with many heads, and one particular naga (the serpent king Muchilinda) played an important part of the Buddha’s path to enlightenment. Ornate and fierce-looking snakes are on the sloping edge of many roofs in Thailand as part of the protection around the holy site.